We could take a little refresher course on why Cupcake Cakes are evil. After all, what better way to celebrate the cupcake than by protecting it from unholy perversions which must be stopped before cake art as we know it is ruined beyond all saving!?! Yeah, I like Option B better, too. As you can see, both types of CCC are what baking industry insiders refer to as "fugly." What's worse: that this is supposed to be a sombrero, or that there's even more icing underneath those paper wrappers, gluing them to the board? Or maybe it's a flying pickle. [head tilt] Huh. 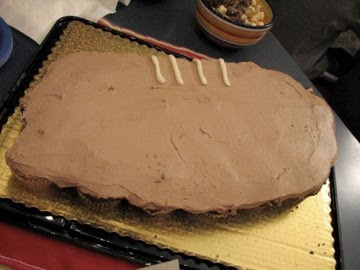 [throwing down spatula] "Meh, it's a football. Time for my break." I'm pretty sure "No Intelligent Life Found" means this is supposed to be a UFO, but that doesn't mean I can't appreciate the irony. Matt H., Chessa N., Lauren R., Jennifer R., Brittany H., Amy L., Nathan, Nichole B., & Beth, go forth and eateth thine cupeth caketh in exceedingeth celebration. 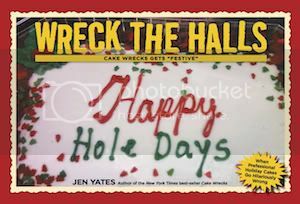 Related Wreckage: Cupcake Cakes: Always Wrecktastic. Always. I am for sure going to order a chihuahua with a mustache in CCC form for my next party. I think the crying fish/airplane one is upside down, and those circles are supposed to be bubbles. And the flying pickle one looks rather like a cactus to me. That first one looks like a clown's wig!! There's so much icing on that "sombrero" that my teeth hurt just looking at it! That's a sombrero???? I thought it was a traffic cone! and the one after it looks like the old-school game Frogger. But caterpillar highway works too! I'm going to come back and look at these CCCs when I'm not on narcotics to see if I can make any better sense of them. Something tells me I won't. Well, happy cupcake day, world. i'm really lovin' the "fish"'s facial expression. or, at least, i'm assuming that's his face. [rolls eyes] ccc's are such posers: they're constantly trying to be something they're not. and what's worse is that they fail at it. over and over and over. for example: they're famous for being lopsided circles. they just don't measure up to real cakes. Oh, hell no!!! That last one?!? Seriously? CCC's are the spawn of the devil. Truly. Thanks for the laughs. I think I'll go to my favorite cupcake bakery today to celebrate. This bakery doesn't even make CCC's. They are cupcake purists. You'd love them, Jen. I like frosting. No, I love frosting. That being said, I do not like frosting on my fingers, and I just can't see a way to eat these cupcake cakes without getting frosting all over my fingers. Give me a piece of cake with that much frosting so it's on a plate and I can eat it with a fork. You know, I think you could actually make a successful poodle CCC since they're meant to be all bumpy and curly round the outside anyway. Still way too much frosting and a horrible idea but at least it wouldn't have those horribly misshapen edges. I laughed until I cried. Thanks! The pickle cactus kinda looks like a space ship to me...with holes for the windows. Or *head tilt* I have unresolved Freudian issues. Oh dear im laughing so much it hurts....Cupcakes or Fairy Cakes as we used to say here in Great Britain are lovely but these wrecks are so BAD they are GOOD! How do you mess up a football?! It looks like something a cow left behind. Perhaps some of your best writing and captioning. But CCC lend themselves to ridicule more than the average wreck, you had an easy job today. No ship Sherlock... If there was intelligent life in the bakery, these "things" would never have been created. WV: nomsin... I'd like to nomsin cupcakes, but there's way too much frosting on, under, and around them. The first one looks like a clown's wig to me. The unknown one looks like flip-flops. These are so weird!! What is the first one? A gay pride feather duster? I also see a seasick fish, a diabetic coma-inducing Christmas bell, a muddy stream of colorful fish, Jen's well-dressed aliens, The Mask or a moldy cow skull or a hideous moth, (I'm afraid to admit to what I thought the next one was, but I can say it is wildly inappropriate!) a section of the streets in Oz, and a pink poodle with a kickin' moustache but no legs. I'm pretty sure I should be committed. Maybe today is National CCCC (CCC Catastrophe) Day...though with what we've seen here and in our local bakeries that is everyday! @ The Curteous Chihuahua - I was here last week and on narcotics for minor surgery... Back this week without..
Trust me, it doesn't really matter whether you're on the good drugs or not. It still won't make any sense. Is the first one some sort of native american headress? A warbonnet with with different colored feathers? The poodle one really isn't that bad! I could see myself loving that cake... when I was four. my teeth hurts just looking at all those icings!!! THanks! You have provided me with yet ANOTHER reason to hate stupid little puff-cut poodles! I'm an icing lover, too, the old-fashioned sickly-sweet kind - so shoot me. Anyway, is it just me or does it seem that the pink on the "flip flops" is airbrushed on? The colouring is nice and even, however how else is the white icing immediately underneath (there are two spots where the icing has been gouged) explained? Your commentaries had me falling out of my chair laughing! I was diggin' those amorphous flip-flop-alien-thingies! I kinda like the Poochie CCC. Those were flip flops? I thought they were slightly stylized dogs wearing necklaces. FLIP FLOPS? for a cake? NOOOOO. "necklace wearing alien blob with hives??!!" ROTFL!! WV: sworzi. I could've sworzis CCCs came from ze depths of Hell. I thought the first one was a clown wig until I realized it was "supposed" to be a beach ball... should have stuck with clown wig, it's a pretty good interpretation of that! The last one is Poochie! I swear! But I still think CCCs are evil, I promise. I love frosting, but even I have my limits. These make my teeth hurt. That poor poodle needs a wax job pretty bad. I don't care if you shouldnt wax a poodle, all the other dogs on the block are laughing! wv: heari - "Heari, heari. I now declare all CCCs a crime against nture." the pink one is flip flops ! 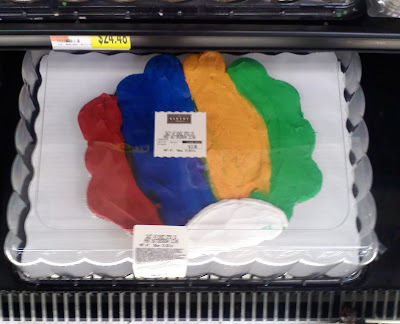 I think that first one is the scalp of a clown. -->That "football" looks like a giant turd at first glance. oh my....Those are supposed to be flip flops. Cute little flip flops with flowers on them. Lord help me if I ever see the feet they were meant for. Yikes. Wrecktastic! OMG these are just so wrong on a multitude of levels! Hysterically funny and thanks for the daily laugh, but wrong. Just. Wrong. 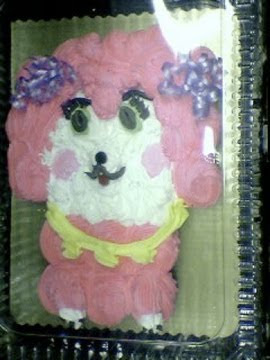 wv: depadu - If something like this ended up at my house on my birthday, my husband would be in depadu-doo. 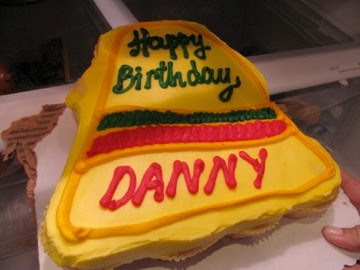 Is the sombrero one a pyramid of cupcakes, or one layer with a block of frosting on top? Now, I do agree that these are ridiculous, and the first time I ever saw a "CCC" I was like wth?! BUUUUT I will say that I have eaten a cupcake from one of these CCC's. Half the icing from the other cupcakes ended up just sticking to the one in the middle, which was MINE. Is it me or does the "UFO" on look like it says, "No Intelligent LIFF Found?" At first glance I thought the sombrero looked like a bell. What exactly is the last one supposed to be? Doll? Clown? AAHHHH! Ugh. I had no idea the pink things were supposed to be flip-flops until you told me. Thanks for the clarification. When, oh, when will bakeries -- yes, even Wal-Mart bakeries, ban CCCs? I have to give props to the "mosaic" style though, because at least their only offense is being ugly. Those icing-dump ones could put a whole room into a diabetic coma just by looking at them! Jen, that last one is Poochie the Flower Power Puppy (a cartoon from the 80s)! Gaaahhh! The banana slugs return! WHY??? Honestly, if you want cupcakes, just make some freaking CUPCAKES ... with a flip flop on each, or a sombrero on each, or something, but seriously ... too much icing, too ugly in general. ugh. people. insanely bizarre. the lot of them. Those are FLIP FLOPS? Surely you jest. Looks more like they gave the preschoolers coloring pages of bacteria pictures. And the first one is a beach ball? Huh. I was guessing hot air balloon but the basket was missing. WV: helne--self explanatory for these wrecks! Right on, Jen! CCCs, ptooey! I love that we totally think alike on some stuff: I looked at the caterpillar highway picture before reading your comment on it and thought "why would anyone want to make a caterpillar highway???" and then found you had thought the same thing. So cool! While I do think every day should be "National Cupcake Day" I'm not sure if it's actually today. According to this: http://www.tfdutch.com/foodh.htm today is actually "National Soft Ice Cream Day" and "National Cupcake Day" falls on December 15th! Doh! You had a spongebob CCC on a while back and THAT was the funniest CCC EVER. Bit coming in second in the mustachioed poodle, with the eyes of Tammy Faye. Don't be ashamed, Horserider. I saw TX too. Hey where's the huuuaaack Ptooey? These are quite memorable, but in the wrong kind of way! This has cemented my anti-CCC stance. I kinda thought the flying pickle/cactus one kinda looked like a dragon head but without any eyes. It looks like a spaceship to me too! CCC's are made at the bakery at the grocery store where I work, and they don't look all bad, but then again, we have an awesome decorator! OMG! "Highway of Caterpillars!" That was the best! Cupcake rant: The record breaking, biggest cupcake has been in the news recently (and I think Duff from Ace of Cakes once tried to create the biggest cupcake). But, via the fact that they are regular cakes stacked and cut to look like a cupcake, they aren't really cupcakes at all! Why are we allowing this travesty? What is the true definition of "cupcake"? Wow - these are super bad. I thought the sombrero was a piece of candy corn... I would have never figured it out on my own. And those so-called flip flops!?! Seriously? Still confused about what the 'flying pickle' thing is supposed to be? The football made me laugh... it does look rather defeated doesnt it? The rest? What were they thinking?? Highway o' caterpillars. Thanks for the best laugh I've had all week! I think I now know why my friend Betsy is so anti-sandal. That was probably her cake one year. I now understand, and will no longer poke fun at her completely covered feet. Seriously, I can see alien arms reaching down to hold those daisies. I think the cactus one is a dinosaur footprint. Maybe. Not good. Not good at all! Ugh. No cccs for me! i have to say, i did enjoy the eric carle caterpillar cupcake cake, but i think that was the only exception to this rule! umm.... to keep adding frosting doesn't mean you are adding quality. that sombrero seems like it would feel like biting into an icing pimple. and is that a football? I thought the "sombrero" looks like a fireman's hat. The first one is a beach ball???? I thought it was a rainbow that ended in a white cloud. Wow. Interpretation is everything in CCC world. I appreciate your judicious use of the word "fugly." It pretty much summed up the whole cupcake cake experience! Lol! 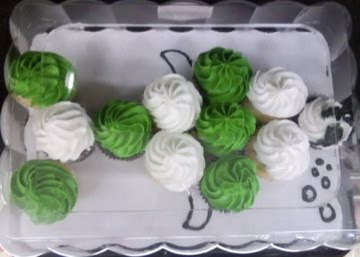 I don't believe for one moment that cupcakes themselves are in favor of being used in this demeaning way. Has anyone ever asked? Probably not. But they can't! They are invariably trapped in plastic-container prisons, doomed to be sold "as is," never to know the joy of being recognized as unique (more or less) individuals. I actually love cup cakes...little cakes, get your cake fix. 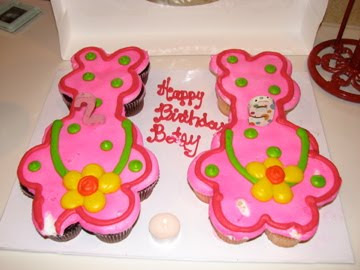 However, these CCCs make me want to barf and never eat cake again....sadness. No Intelligent Life.... so, so true. It all left via the highway 'o caterpillars. Sombrero- I thought it was supposed to be a bell, but no clapper and no relevance to a birthday. Not that relevance is needed. I'm ashamed to admit. I did order a CCC for my son and daughter's birthday one year. It was frosted with gobs of black icing and had a plastic batman symbol stuck in the middle. Not that there is any excuse for that level of abuse, but I was two weeks away from giving birth and at that point I probably would have been happy with the "decorated" cookies in the previous post. Ok, now that I've gotten that off my chest, love your blog! Please, keep the laughs coming. Totally thought the sombrero was a broom. I've always maintained that there are cupcakes and there are cakes and never the twain should meet! after seeing these ccc's, I am certain of it now. I agree with Jasini, the fish is upside down and those are air bubbles. See, now it looks like an eye and a smile (?) on the "face" cupcake. And the sombrero looks like a broom. There's even a white pole coming out of the top. The "sombrero" should be in a locker room somewhere with "Cuidado Piso Mojado" written on it. CUPCAKES RULE! Obviously, you've never been to this place: http://www.socupcake.com/. Oh my goodness. That football looks like a potato! Wow, some really awful CCC's (and some fine writing) today. I especially liked the "cake board" (hastily torn up cardboard box) that that fine sombrero CCC was presented on. And the Mardi Gras cactus cake...seriously...WTF is that supposed to be? Never before has a website given someone diabetes. Those are bad. Just bad. Especially the googly eyed poodle(? )at the end... I'm scrrrd. this is a very, very common misconception and it bothers me when i see it reinforced by authors that i usually enjoy. all carbs break down into glucose. i have to take more insulin for eating a sandwich than for eating a cookie. The last one looks like someone dressed up Philippe from Achewood to be a very pretty lady. I´m pretty sure that green thingy is a distorted alien head with really bad acne. I like the flying pickle/ mardi gras cactus mask. All aboard Air Gherkin! I kind of like Poodleface. LMLFAO! Wow...so many things, lol. Is that supposed to be a beach ball?! LMFAO! I thought the "Sombrero" looked more like an fugly Magic Carpet, lol, or maybe a towel? LMFAO @ the Frogger interpretation of the hamburger, I agree, lol. The flip flops look like bears pimpin some ugly bling to me, lol. I'm sad to say that my first thought when I saw the cactus one was jock strap, LMFAO! I think Mardi Gras mask is more likely, lol. I think the mustache on the dog is supposed to be part of the snout, lol, people tend to do an upside-down Y for that, but it didn't work right, LMFAO! Those were great! I just asked my 6 yr old what he thought the green one was and he said "I think its a dinosaur foot print"
I see that narkej had the same thought! I think the Mardi Gras cactus mask is supposed to be a dragon or a lizard. Maybe. If the empty spots are eyes anyway...Who knows? There are things in life we are all better now knowing (I normally include calorie counts in that category) and the purpose of this CCC could be one of them. LMAO! this CCC Wreck was AWFULly BAD! But the commentary, was as delightful and snort-inducing as ever! 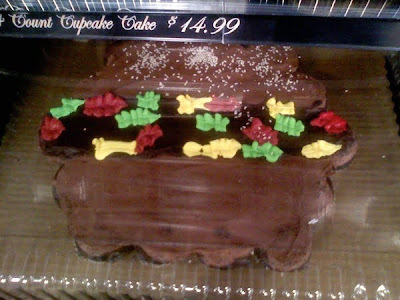 I think the "cactus" cake is a horribly wrecktastic version of a Romulan Warbird, ST:TNG-style. You know, the big green ones with that open area between the top and bottom hulls. I'm disappointed, Jen! Thanks for telling us what the cakes were supposed to be, I had the hardest time! I thought #4 (apparently allegedly supposed to be a hamburger) was a badly done basket of flowers. I spotted a better looking cactus CCC at my local Walmart. I actually thought they did a decent job on it. At least for a CCC anyway lol. Its waaaaaaaay better than the pickle one thats for sure. i got to say, i just loved this blog, it so made my day, and a smile on my face too. thanks loved the end, it was great! The worst part for me about the sombrero CCC is the ripped cardboard stabilizer underneath!Nothing says professional like raggedy edges. That last one's a poodle? Honestly? All I could see was an old lady with serious facial hair issues. Horserider and Becky, I think that IS supposed to be Texas. What's worse, it looks like a weather map. Those little black swirlies look like the graphic that depicts tornados. If that's true we're in a lot of trouble here, that's a LOT of tornado action! I must share, okay, I must admit... *GASP* that I bought a butterfly cup cake 'cake' for my daughter's 4th birthday. When we got home, it was more of a 'Monet' painting as it was not secured on the bottom and they all slid around completely destroying the 'butterfly'! Great post. I had trouble reading your intro though because of an all bran add. Stupid Kellogg's ad is covering part of your text. Even "close" doesn't make it small enough. FYI: Couldn't read it as Kellogs advertisment was covering it up. When I hit 'close X', it covered half. I am sure it was funny and cute as always. I looked at the first one and thought, "Who plucked the NBC Peacock?" Then I thought ... and thought ... and thought. Love the Hell's Kitchen reference. I am totally in love with Chef Ramsay! I think that cactus/pickle is supposed to be Baby Bop from Barney. Maybe. I got that sick sugary feeling you get from eating cupcakes just by looking at all those pictures. That last one looks like Ultra Peanut! Is that last one meant to be Poochie? @miss_k, seeing that as a game of Frogger works too. I was still waking up when I first looked at that and got a badly done basket of flowers. My husband looked at the brown one and said "Is that a poop surfboard?" Glad you were able to identify the brown blob. Most sportsmanlike! Entirely randomly, today is my birthday and a friend gave me six cupcakes from a local bakery called the Cupcake Station! Happily, they were all individual cupcakes, living in blissful independence, with their own types of frosting. They are cute and delicious and exactly how cupcakes should be, and it's only fitting that it happens to be National Cupcake Day! Wait, isn't the green mardi gras mask really a close up of a sock-filled speedo (or banana hammock thong)???? CCC's should be banned. I say we start a grass roots revolution to stop this blasphemous trend! I just love that they're all so horribly (and wonderfully) shaped! If you look real closely at that green mask/cactus thingy, it appears to have little singing faces and music notes on it - so maybe it's a park? Or something? Trying to do cake art with cup cakes is like trying to use just a few, giant, pixels to make a digital photo - it's way too clumsy and it just doesn't work! To me it looks like the taco bell logo, but the WORST part is that its on a torn, recycled piece of cardboard. I think that last one is supposed to be Dolores Umbridge + mustache from Harry Potter. What IS that first one anyway? A hot air balloon? That green cactus mask looks like a Romulan ship from Star Trek: The Next Generation. What is that last one? Poochie? Does anyone else remember Poochie? I'm not talking about Itchy & Scratchy's third wheel, this was a pink-haired brushable toy dog from the '80s. I thinks that unidentifiable CCC may be a dinosaur track. I only say this because my 6 1/2 year old is a dinosaur freak, and that's what it reminds me of. OMG I just almost wet myself reading this post. You've got another follower. I think the second one is upside-down and meant to be a fish. The little circles drawn on the cakeboard are suppose to be bubbles rising from it's head. Also, that white cupcake at the end has an eye and half a smile piped on. It's definitely upside-down. HI , i recently found this blog and I looked through almost all of the old submissions. This is my first post. It has been a long time since I ve laughed out loud so much. SOme of the cakes are sooo funny..
Yep Poochie was around when I was a little girl in the 80's .Every thign of her was heart shaped her rug, bath ,etc oh and pink too. you say football, I say baked potato with fork incisions to vent. First, thanks for a great website, just too, too funny! Here's something you might want to look at, it's a silicon cake pan that has two parts...to make a Giant Cupcake cake! I immediately thought of you! It "measures 15-1/4" x 8-1/8" x 3-1/2" overall; the finished cake measures approx. 7" x 6-3/4" dia." You know what that quote-unquote "sombrero cake" reminds me of? I bet you that's just how the birthday boy felt after seeing that quote-unquote "cake". I can't believe someone made a POOCHIE CCC...and that I could actually recognize it! Mad props to whoever bridled their restraint and pulled it off!!! 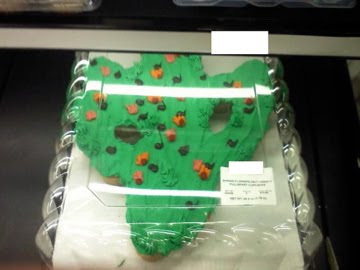 I would so buy one if it showed up at my local bakery. Cupcakes are awesome. CCCs defeat the purpose of cupcakes: Cakey goodness without getting icing all over your hands. I took one look at the football CCC and thought "It's a giant turd. With tapeworms." Seriously, four years of vet school does weird things to your head. 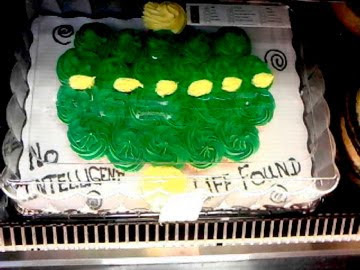 You really haven't experienced cakewrecks until you have perused it with a recent Ethiopian adoptee who just keeps repeating two English words that he knows. To wit: cake & nasty. I'm pretty sure we've all agreed that cupcake mosaics are badarse, though no harder to wreck than ordinary cakes. I think the two pink ones with flowers are suppose to be flip flops LOL! The plane one is suppose to be a sea turtle with bubbles, I think. LoL A lot of those really are up to interpretation. Could the green cactus looking thing possibly be the mask from the movie THE MASK? Oh ye gods -snort- this is still my favourite cake wreck of them all, because the phrase "highway o' caterpillars" makes me laugh every single time I read it! "necklace-wearing alien blobs with hives"
Possibly the greatest descriptive line I have read in ages! LOL - LOVE IT! That football one...what's the point? Why not just ice each cupcake individually and say, "Hey, come get your chocolate cupcake!" That last one is totally supposed to be a Shampoodle! It's a toy from the 90's...and I had one. It looks like a green wolf with a serious acne problem. the "flying pickle" is a cactus, and the fish one is upside down, just like @Jasini said! Ok, You Win. I'll Post the Divorce Cakes. Forget the Ballgame. Just Take Me Out. "I'd Like a 3D Ocean Cake, Please."